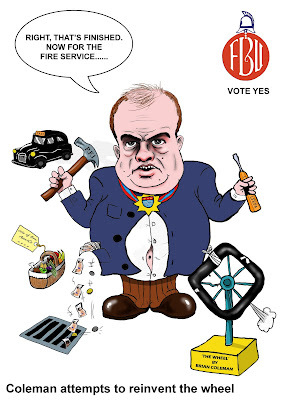 Brian Coleman (aka Mr Toad) has got to go! : Farenheit 451 and the 'gilded fool'. Farenheit 451 and the 'gilded fool'. Echoing the fire chief in Ray Bradbury's 'Farenheit 451' - fire chiefs in London have ordered the destruction of a picture of a certain 'gilded fool'. The poster, it seems, is a 'safety risk'. "This age thinks better of a gilded fool than of a threadbare saint in wisdom's school!" Its a little obscure I admit, but I couldn't resist it.